How can my students pin their frequently-used subjects? Your students can pin a specific subject on their home page which can be beneficial for bringing subjects that are used frequently to the forefront in the Student Zone. When your student logs in to Education Perfect for the first time, they will be asked to select the subjects that they are interested in. The subjects that they have classes for will be suggested at the top of their homepage. When they have selected the desired subjects, they can click Done, start learning! to confirm. Clicking on each subject will select it. They can click the subject a second time to deselect it. 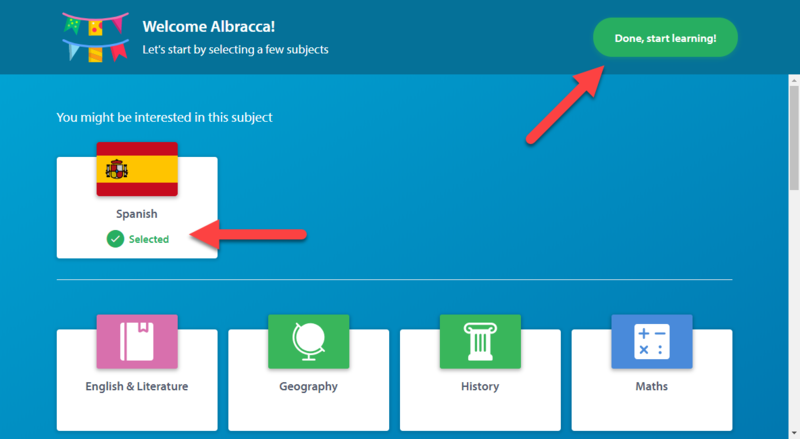 If your students decide later that they would like to pin additional subjects, they can click Choose your subjects on their Home dashboard. Your students will then be able to select and deselect any subjects they choose. Your students will not need to confirm their new selections. They will automatically be able to see their changes when they return to their Home page.